Today is not only Halloween. While we at the Breast Health & Healing Foundation wish everyone a happy and safe Halloween night, we’d like to remember that today is also the last day of National Breast Cancer Awareness Month. As a community, we must be vigilant in performing our monthly self-exams and teaching our young daughters and granddaughters the importance of early diagnosis. Once we hit our 40s, we need to begin undergoing yearly mammography testing. In the United States, one out of every eight women will be diagnosed with breast cancer at some point in her lifetime. As such, it is vital to get diagnosed early to have better outcomes from cancer treatment. On the last day of National Breast Cancer Awareness Month, it is worthwhile to spend it discussing the history of this month and how it has advanced breast cancer research. The peach-colored ribbon was aimed at cancer prevention, explains ThinkBeforeYouPink.org. Haley was spreading word of the peach-colored ribbon through her neighborhood by word of mouth and had reached thousands. Then she got a call from representatives at Self magazine. The representatives wanted to take the ribbon and her cause onto a national stage. However, Haley declined, feeling that this would be “too commercial.” Estee Lauder had also tried to work with Haley, but had no luck. The legal team for Estee Lauder decided to choose a different color and use a ribbon to bring more awareness toward breast cancer. This is how the pink ribbon was born. The Breast Cancer Consortium detail the history of the National Breast Cancer Awareness Month. The first October hailed as Breast Cancer Awareness Month began in 1985 and was a partnership between the American Cancer Society and the pharmaceutical division of Imperial Chemical Industries. 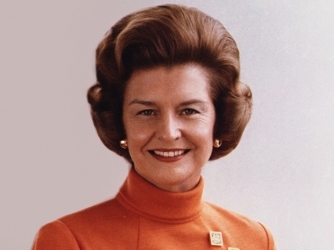 Breast cancer survivor Betty Ford began the first week-long breast cancer awareness event with multiple television appearances. This has all led to more educational and fundraising opportunities for the cause over the years since 1985. This month is devoted to public service announcements, education, and advertisements regarding breast cancer awareness. Breast Cancer Awareness Month has been dedicated to supporting regular self-exams and yearly mammograms once a woman turns 40 years of age. This month has also been dedicated to encouraging women to make regular appointments with their doctors, following all treatment prescribed by their physicians, and becoming more educated on breast health, according to EmaxHealth. In 1993, President Bill Clinton designated the third Friday of October to be National Mammography Day. Companies, clinics, and radiology departments were all encouraged to offer free or discounted breast cancer screening on National Mammography Day. Furthermore, mammography slowly became ingrained in state and federal healthcare programs as well as employer health insurance plans. National Breast Cancer Awareness Month has given countless charities and organizations a timeline for promoting the cause and bringing more fundraising their way. Over the years, neighborhoods came together to form walk-a-thons such as the Avon Walk for Breast Cancer in order to raise money for breast cancer research. In fact, this month has grown internationally with a Global Breast Cancer Conference held in Seoul, Korea October 8 through 10. While October is nearly over, treatment and side effects for breast cancer patients worldwide do not end today. Breast cancer treatment lasts months if not years depending on the stage of the disease. If you would like to put an end to breast cancer and make sure no more men and women have to go through the grueling treatment of chemo and radiation, donate to research on the preventive breast cancer vaccine. You can donate to the Breast Health & Healing Foundation by clicking here and your funds will go directly to breast cancer prevention research (the vaccine and virus). You can also consider buying Dr. Kathleen Ruddy’s latest book The End of Breast Cancer: A Virus and the Hope for a Vaccine. This book will teach you all about the breast cancer virus and the potential for a preventive vaccine. To learn more about this book, click on this Amazon page. If a person has a family history of breast cancer, then she should start mammograms at less than 40. I started going when I turned 35 in 2008 because I have a mother with breast cancer. She was diagnosed at age 47. I am dreaming of a preventative breast cancer vaccine so that I would not get the disease or have recurrence.